So, the dark nights are actually drawing in. Scrap that. They’ve already drawn in. It’ll be dark, cold and wet runs for the foreseeable future. Not all doom and gloom though, it’s a chance to dig out those merino baselayers, re-proof the gore-tex and get muddy / snowy. Maybe even squeeze in some time to write up some kit reviews! So, let’s start with some footwear. 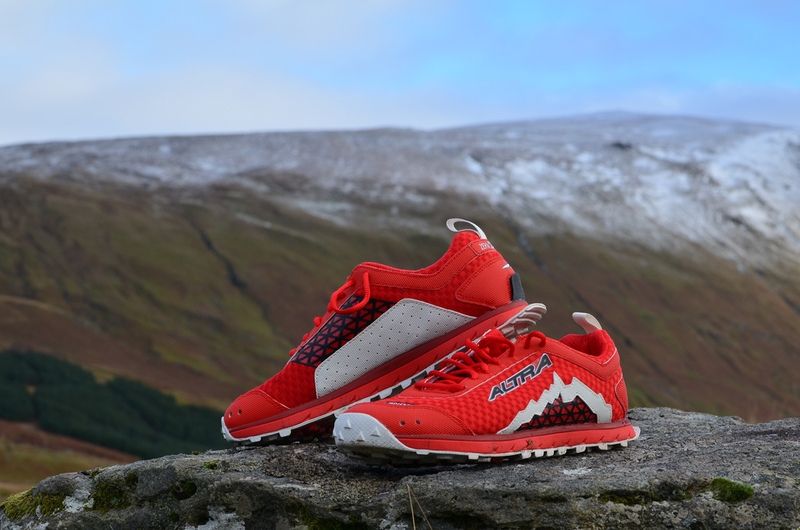 Altra have recently launched their zero drop shoes in the UK. And as a ‘barefoot’ or ‘minimalist’ runner (insert any other buzzy term) I’d had my eye on them for a while as they were getting well used and tested in the States. There had been a fair amount of twitter chat about them too and as usual it seemed that we’d have to wait a while to get our grubby UK mitts on them. 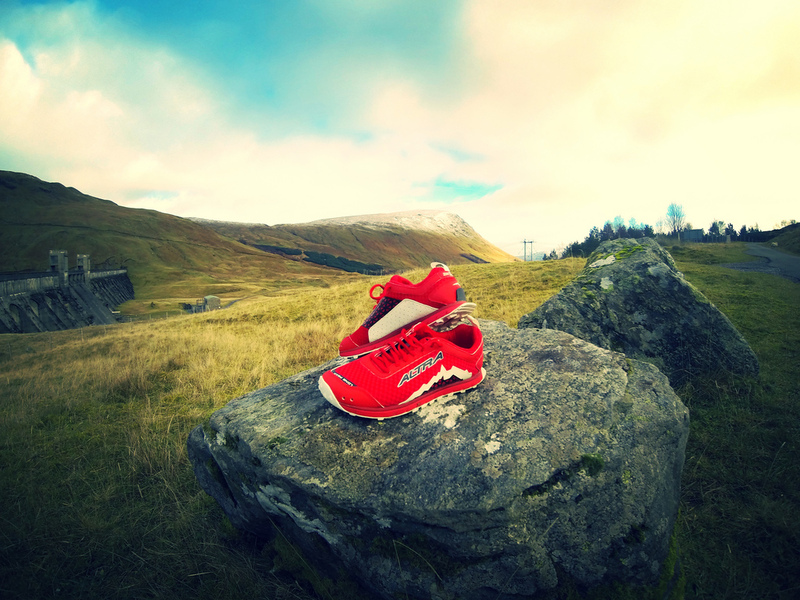 So, I was delighted when Altra delivered a fresh pair of Lone Peaks – their flagship off-road shoe. As the Lone Peaks (and all others) are new to the UK it’s not really worth me pointing out the changes from the originals (as I’ve never tried them), so I’ll talk as if these are v1. First impressions? They’re red! Proper red, a white sole and a good-looking, well-styled upper. If you run fast enough, (maybe freeze your corneas for a while) you’d be forgiven for thinking they were Salomon Sense’s such is the standout colour-way. The similarities really end there though. The first thing you’ll notice is the toe-box section. Really rounded, giving your toes much more room to splay and adapt to the terrain rather than being forced into acting as a single unit with the more traditional tapered toe-box. You also notice a strange flappy bit at the heel of the sole – the ‘trail rudder’. Apparently there to provide stability on steep or loose downhill sections. Can’t say I noticed it or that it really bothered me either. Would be easy to remove if it did. The Lone Peaks are a heavier shoe that I normally run in. Compared to my NB 110’s MT00’s, Salomon Sense’s or Vivo’s, they’re a chunky shoe. So forcing a comparison to those probably isn’t fair. But that’s maybe where their strengths lie. They feel much more like zero drop versions of some other hugely popular trail shoes like the Brooks Cascadia or S-Lab XT, so in my mind might be a really strong option for those tempted by the ‘Born to Run’ trend of adopting a more natural (non-heel-striking) running style. I’d even put them up there against a Hoka (some of which are zero-drop I believe?) as they would at least allow you to develop a more natural style than having to radically change your approach to run in the high stacked EVA filled soles. As I said already, they’re a chunkier shoe than I’d normally wear. 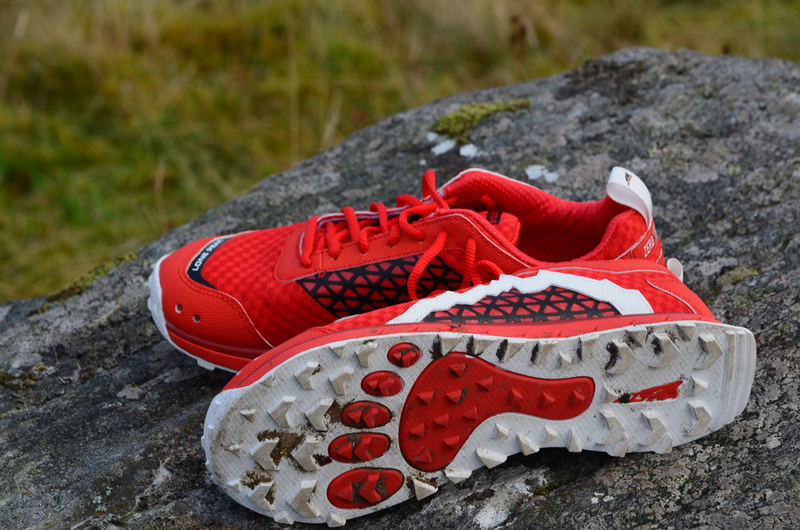 With a stack height of 23mm and the grippy sole / lugs they feel much more substantial and give a certain amount of confidence as you head onto a stony or rocky trail. Something like Lairig Mor at the end of the West Highland Way (or the route from the summit of Bowfell towards Esk Pike and Great End) would be a cinch for the Lone Peak’s – offering some level of feel whilst comfortably absorbing some of the sharper rocks that have a habit seeking out an unprotected plantar tendon. Thumbs-up for some, maybe a little too much between ground and foot for those used to running in something lighter. There is a slight lack of flexibility in the sole but again that’s more in comparison with what I normally run in. The sole offers a good amount of traction without feeling cumbersome when you hit the flat stuff. 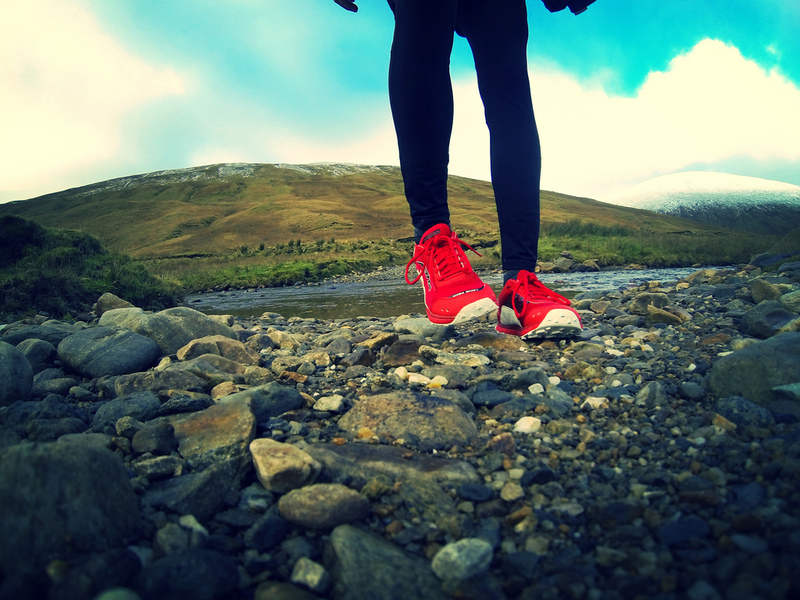 You don’t get that feeling you’re running in football boots on concrete when you’re forced onto some flatter trails or tarmac (you know that feeling you get on that last stretch of road coming off a hill in the ino8 x-talon or the Salomon fellcross). I found them good on grass and as good as any sole can be on wet rocks in winter. The upper feels well-made and durable but still pretty soft and seam-free where required. There’s a fair amount of material / padding here which again I don’t normally find on my feet so might be a good winter option on colder days for the protection alone. Only little draw-back I found with that was after a river crossing. The inside of the shoe seemed to drain quickly enough but the padding (particularly around the tongue) seemed to hold onto the water for a period. Apparently the Velcro on the reverse is to support a gaiter fitting – this I’d be very interested to see and something I’m surprised doesn’t get more attention from manufacturers / retailers? (I’m just bitter as we never got the NB110W’s in the UK). This might help with the water retention issue potentially too. As an aside, has anyone got any decent running gaiters that actually cover a lot of the shoe? PS. In terms of fit they seem to run pretty true to size. I went a half size up and I’m not sure it was needed. This entry was posted on December 4, 2013 by pyllon. It was filed under Altra, Gear, Lone Peak, Review, Running, Running shoes, Trail, Ultra, Zero drop and was tagged with 1.5, Altra, hill running, Lone Peak, review, running shoes, ultra, zero-drop.